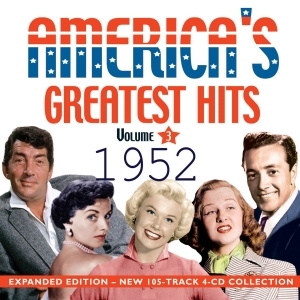 We continue our highly popular and successful America’s Greatest Hits series as we work back through the 1950s, this time with an expanded 4-CD set edition to sit alongside the existing single CD 1952 edition (ACRCD180) originally released in 2006 before we introduced the 4-CD format in recent years. This great-value 105-track collection comprises every record which charted in the Top 15 of the Billboard Best Sellers and Cash Box chart, or in the Top 10 of Billboard’s Most Played by Jockeys, Most Played in Jukeboxes Charts or Honor Roll of Hits during 1952 (it omits certain records which peaked in 1953 and which have already appeared in our America’s Greatest Hits 1953 collection and some which were big hits in 1951, and had already peaked, so will appear in that collection). As with all these collections it features all the biggest hits of the year and all the biggest names in American pop of that era, so very much captures the spirit of the times, but also includes a number of lesser known records which are not heard very often and which have not been readily available on CD. As always, it includes a substantial 12,000-word booklet with a commentary on every track, and it’s a must for collectors of our completist chart-based anthologies. 10 Blue Tango Hugo Winterhalter & His Orch.